I believe that I have mentioned – in passing, perhaps – that it is summer? I usually discuss the seasonal influence on my cooking in terms of seasonal food. It is summer – so I cook corn and tomatoes and summer squash. It is summer, so I eat salad for lunch. But you know – it is summer, so I do not want to turn the oven on… particularly for anything that will take more than 20 minutes. 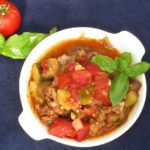 I have learned that many people think of slow cookers entirely for winter stews and pot roasts – and put them away in the summer! But, years ago I visited cousins in Texas, and they all had several, and used them constantly in hot weather, because slow cookers don’t heat up the house the way an oven does, or even a long stovetop simmer. I use mine to cook one big piece of meat – a chicken, say, or a pork shoulder. I cook it over night, so that I’m not even in the kitchen, and it is the coolest part of the day. Then I can either eat the meat cold, or quickly reheat it in a skillet or the microwave – without standing over a stove in hot weather. I took a bunch of rainbow chard, removed the stems, and chopped the leaves more finely than usual. (When I simmer it I eat the stems, but I don’t think this treatment will make them tender enough.) 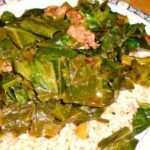 I washed and dried the chopped leaves, and then sauteed them lightly – not enough to fully cook, just to let them soften and shrink a little. Then I mixed in about a tablespoon of minced basil, and another of minced oregano. (Actually – I’d been pureeing each of them in oil earlier, so reserved the last of each batch for this recipe… but if you haven’t happened to do that the same afternoon, mince fresh, or use a cube of frozen, or substitute 1 teaspoon each of dried.) I also added a pinch of salt. Then I set the herbed chard aside to cool slightly. Once I had the rough rectangle of meat, I carefully distributed the chard over it. I was honestly a bit surprised that it all fit… don’t worry if you have extra! I then rolled it carefully from one narrow end, and secured it with silicone bands. (No affiliation, I never repped these, I’m sure there are many brands – but these bright, reusable, heat-safe bands are the handiest little things to have! I don’t use them often, but they take little space, and when I do need them, they save me so much time, effort, and fuss.) If you don’t have bands, tie it with kitchen twine, or use skewers. 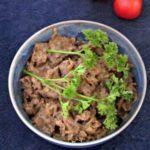 At this point, you can pop it right into the slow cooker, as I did, or you can cover it and put it overnight in the fridge to marinate. The meat will pick up the flavor of the seasoning, and it is all to the good – and it means this is a handy preprep dish – do this much the evening before, put it in the slow cooker in the morning before work, come home to a slightly fancier dinner… Whenever you prepare it, put it in a slow cooker on low for seven hours. 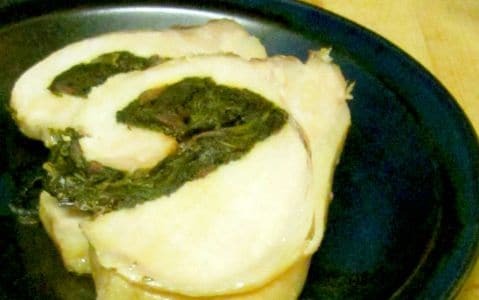 When it, and you, are both ready, take it out of the slow cooker and let it rest five to ten minutes, to reabsorb juices (just as you would if taking it out of the oven.) 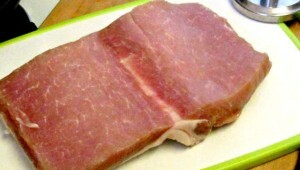 Pull off the silicone bands (or whatever else you used to fasten it) – the cooked meat will hold its shape. Then slice, admire the swirl (or lump, or whatever shape you got) of stuffing, and serve. It’s really not as fussy as it sounds. It’s even easier if you use leftover cooked greens… I chose chard because I wasn’t going to cook it long, but already simmered kale or other greens would be fine. 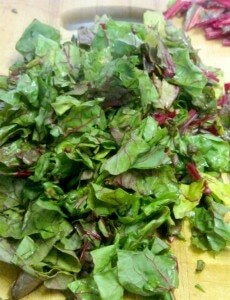 (Don’t use beet greens, though, because of the color!) It certainly looks – and tastes – as if you put a lot of work into it, though – and we all need a few of those recipes up our sleeves! Chop chard small, removing stems, wash, and dry. Heat oil in pan. Saute chard lightly, just until softened slightly, and reduced. Add minced herbs and salt, stir well, and set aside to cool slightly. Butterfly the pork roast, and pound it just enough to flatten. Distribute chard mixture over meat, then roll up and secure. 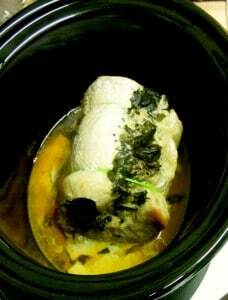 Cook in a slow cooker on Low for seven hours. Let rest ten minutes before slicing and serving. 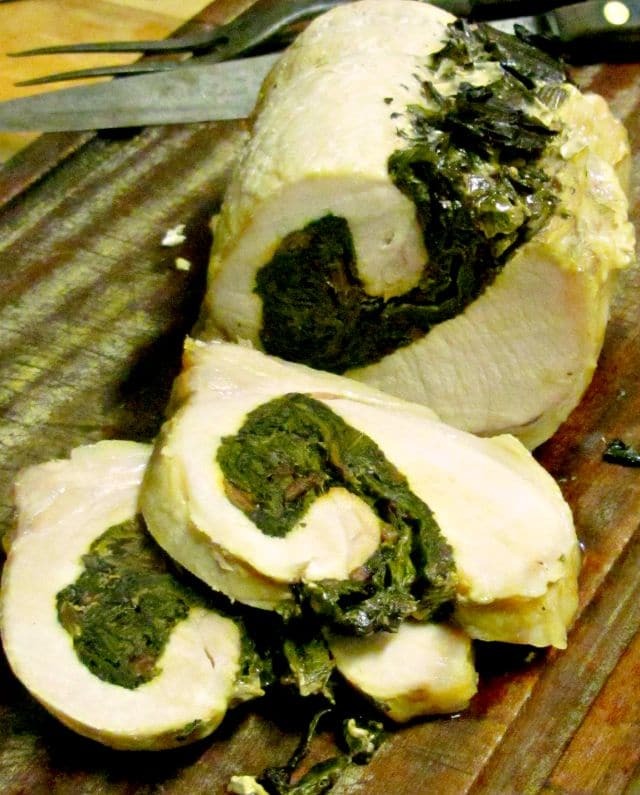 The roast can be prepared in advance and refrigerated overnight before cooking. 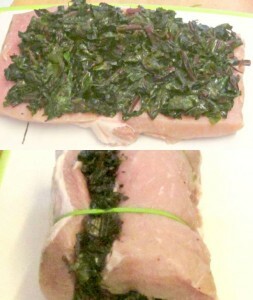 As I said, I do prefer roasting pork loin in the oven myself - the meat is more tender and juicy. But the difference, while real, is slight, and in a heat wave (or, for that matter, when scheduling is an issue) it's nice to have an option. Enjoy it! Thank you! It makes life so much easier, doesn't it? Love pork roasts and this looks so yummy! And it reheats well, and it's good cold... so if he won't eat it, the leftovers aren't too overwhelming... ;-) Enjoy! This sounds wonderful! Great to find another NYC based blogger, I'm living in Brooklyn and totally side with you on the tiny kitchens and way too hot NYC summers. Thank you! I could use other greens for this, but I liked the chard because it is just tender enough that I didn't have to worry about any tough bits, but I also wasn't worried about it cooking to death, as spinach might. You don't see chard in many supermarkets, so people don't really think of it as they do other greens! (Though I think that is improving.) But it is so delicious, I think it is worth looking for at a farm market.